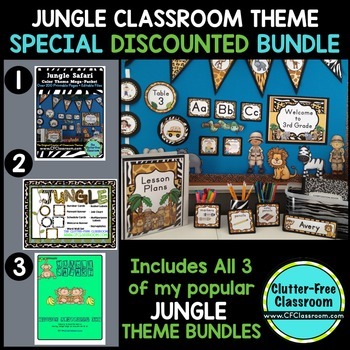 SAVE TIME & MONEY with this Editable Jungle / Safari Theme Classroom Decor Bundle (plus 2 bonus bundles). It will make you a more organized teacher and improve your classroom management. 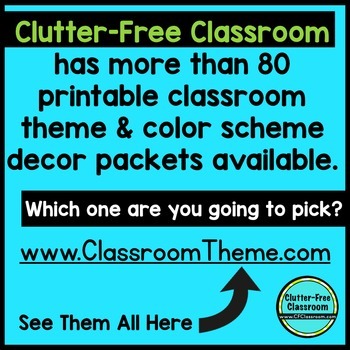 Clutter-Free Classroom Decor Bundles make it EASY to prepare for the beginning of the year on a budget! Picture the looks on your students’ faces on the first day of school when they see their new jungle / safari themed classroom. Your back to school bulletin boards trimmed with a trendy themed pennant banner and matching welcome sign will make them feel at home and enthusiastic about being back to school. Creating a beautiful jungle / safari theme classroom environment does not need to cost a lot of money. 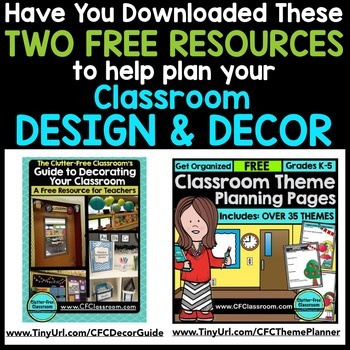 This classroom decor bundle provides you with over 30 different resources that will not only have your room looking the best it has ever looked, but will also greatly improve your classroom organization and management. Editable labels will ensure that everything has a place and purposeful tools like behavior clip charts, schedule cards, dismissal charts and more will ensure that the room is running itself. BASKET LABELS : 5 Different Sets with 6 labels per set. These are great for your classroom library or anywhere else you want to use a label. They fit well onto shoeboxes/small baskets. These are perfect to use on desks. NUMBER CARDS / CALENDAR PIECES - 4 sets with 36 cards in each set (3 in diameter). I assign each student a number to avoid needing to redo things each year. The set includes #s 1-36. These would also make really cool calendar pieces. This set includes a title to display (8.5 x 11), two sets of 4 alphabet cards (plus 2 blank ones), and 4 different styles of blank word cards. Create your own job chart by selecting from these 36 different job cards in 3 sets. The set includes 36 cards featuring a title and Thistlegirl Clipart as well as text-only cards and 6 blank cards for student names. These 3 round and 3 square labels can be used for just about anything. They look adorable when hole-punched and attached with a ribbon. Invite people into your classroom and introduce your color scheme at the same time with these 4squares. They can be made into a banner or displayed as is. Use these 4 colorful cards to create a customized banner. The set includes all 26 letters as well as an apostrophe and an exclamation point. Ideas: Mr./Mrs. ____s Class, ____ Grade, _____ School. 10 different styles of pennants along with special pennants titled with grades PreK-6th Grade. Each pennant measures 4.5 x 7. Simply punch a hole in each corner and thread a ribbon through it. These look great about a bulletin board, over a door, along your desk, etc. There is something here for everyone! The packet includes 54 cards with a variety of titles to meet everyones needs. Each card measures 7.25 x 2.5. Ideas - A collection of ideas to bring your theme together. Please note: The editable pages for this jungle / safari themed resource are included as a Powerpoint file. This will allow you to not only customize labels, name tags, binder covers, etc in your jungle / safari theme files but will also let you save your work to your computer. You can print your jungle / safari theme at home or send them to an office supply store for easy printing (I use Staples for all my printing). 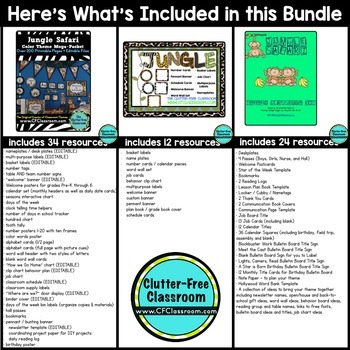 This jungle / safari theme classroom essentials packet contains a HUGE collection of educational resources with a common theme and color scheme to help you create a cohesive jungle / safari theme learning environment. Please note that decorative items shown in the photos for this jungle / safari theme (i.e. bulletin board borders, bulletin board image/clipart accents, baskets, pencils, etc) were used for staging the photos and are not included in the purchase of the jungle / safari theme bundle. This is a digital item available for instant download. No hard goods will be shipped. The purchase is for use in one classroom. Additional licenses are available at or after the time of purchase for use in multiple classrooms.